For many top-flight NHL prospects, playing in the American Hockey League is just a stop along the way to the ultimate destination, a fulfillment of a necessary apprenticeship that in reality won’t make or break a career. But Martin Biron, a first-round draft pick of the Buffalo Sabres, says it wasn’t like that for him. He says playing for the Rochester Americans is not only why he reached the NHL, but thrived once he got there. Those trials and tribulations built a solid foundation for what became 13-year NHL career. He played in 508 NHL games (300 for the Buffalo Sabres) and posted a 230-191-52 record with a 2.61 goals-against average and .910 save percentage. He had 28 shutouts. But before enjoying glory in the NHL, there were many happy times in an Amerks sweater, and his induction into the club’s Hall of Fame will be proof. The Amerks announced on Tuesday that Biron will become the 62nd member of the Hall during pre-game ceremonies on Feb. 16, though he says he wasn’t expecting the honor. “I was completely shocked when I got the call,” Biron said. He must have forgotten just how well he played for the Amerks, especially during the 1998-99 season. The native of Lac-Saint-Charles, Quebec, went 36-13-3 with a .930 save percentage and a league-best 2.07 GAA that year. He posted six shutouts and even had three assists and the Amerks advanced to the Calder Cup finals, where they lost in five games to the Providence Bruins. Yet he remembers his rookie season of 1997-98 perhaps more vividly. That’s when, in his mind, his career was at a crossroads. The Amerks weren’t playing all that well under first-year head coach Brian McCutcheon and Biron, the 16th overall by the Sabres in 1995, was trying to find his way in pro hockey. He didn’t pout, though. He went to the South Carolina Stingrays, intent on getting better. Fate, however, intervened before the week was over. 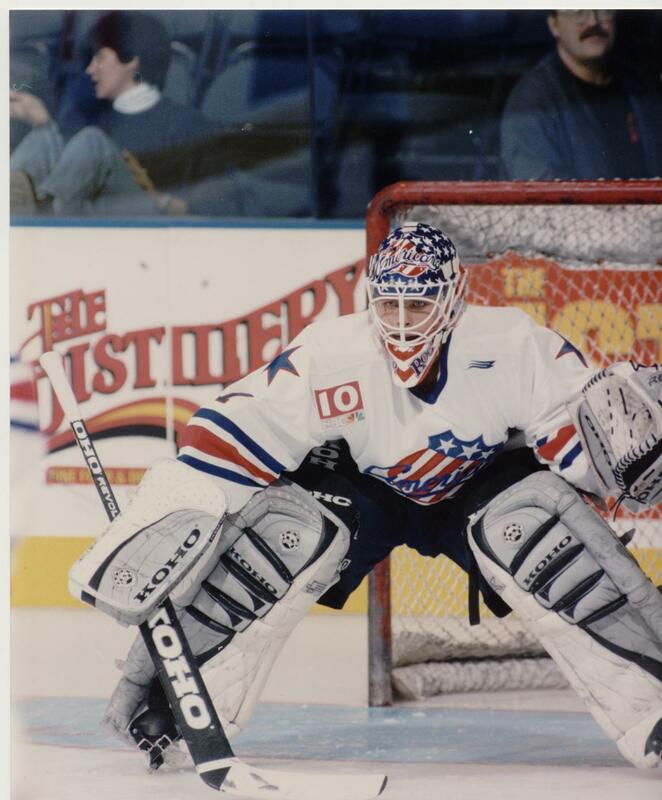 Because of injuries, the Amerks needed a goalie. Biron came back up and was stellar in a 2-1 victory over the Kentucky Thoroughblades. Mitch Korn was the Sabres goalie coach at the time and had accompanied Biron to South Carolina and back. “After the game Mitch said, ‘You went down to South Carolina, you came back to Rochester and played a really good game, and now you’re going to get an opportunity,” Biron recalled. Biron helped stabilize the Amerks down the stretch and they earned a playoff berth, though they lost in the first round to the eventual Calder Cup champion Philadelphia Phantoms. The next season Biron dominated. The best scorers in the AHL couldn’t score on him. 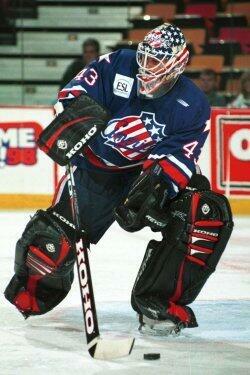 Even as the Amerks defense lost player after player during the playoffs, Biron backstopped them into the finals. He was the AHL’s goalie of the year, a first-team All-Star and along the way he won his first NHL game with the Sabres. He combined with Tom Draper to share the Hap Holmes Memorial Award for the lowest GAA in the AHL. “My goal that year was to be the best goalie in the American Hockey League,” he said. “I wanted to win the Calder Cup and I wanted to win MVP. Now you know why he did so well in Rochester, and why he’ll be the newest member of the Amerks Hall of Fame.